My Potential 100K Blogging Whoops! Have you read articles emphasizing the importance of growing an email list? It’s one of the pieces of advice proclaimed by all successful bloggers. Your email list is more important than your Likes on Facebook. Or your followers on Twitter and Instagram. It’s your ability to reach your audience directly in their inbox. What does this have to do with me almost being sued? Well, I finally created an awesome opt-in after four failed attempts. This opt-in converts at more than 50%! So for every 100 people that view the opt-in page, more than 50 sign up. This is fantastic! Everything was running smoothly. I was promoting my opt-in and growing my email list. It went from 0 to over 1,000 in a month, and it is still growing. Multiple bloggers recommended I create a pretty landing page for my opt-in. But I will still using WordPress’s free themes. And sadly these free themes did not have the capability to create landing pages. If you’re new to blogging, a landing page is a page dedicated to one action. You want your reader to either buy your product or opt-in to your email list or webinar etc. The navigation menu and any sidebars are removed that could distract your reader. It is a page purely designed for one purpose. 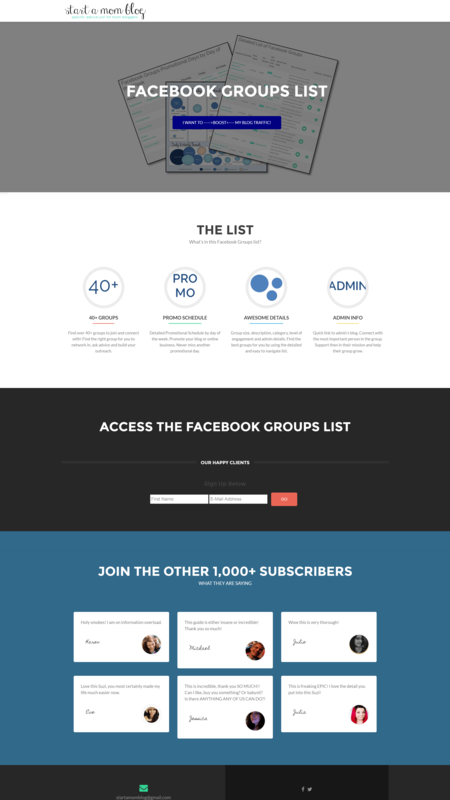 So after 3 weeks of huge success with my opt-in, I finally decided to create a landing page. A guest post of mine was about to go live and I wanted the readers to be redirected to the focused landing page. Because I was still using free themes, I created an entire new website for this purpose. The only cost was the domain of $14.95. I was already on a multiple site hosting plan. Creating a new site enabled me to turn off navigation for the entire site so my readers could be focused on just signing up for my opt-in. Here is what my landing page looked like. Why Did Facebook Want to Sue Me? 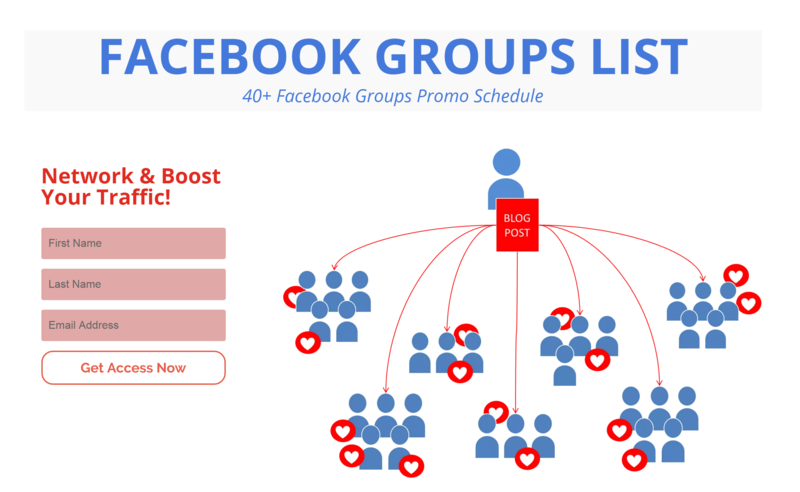 My opt-in is a list of 40+ Facebook Groups with an awesome promotion schedule included. This helps bloggers know when to promote their posts in various groups helping to drive traffic back to their site. The opt-in wasn’t the issue, the domain name was. I bought www.FacebookGroupsList.com, and that was the big no-no. I should have known that using Facebook in my root domain would be an issue. But my cup of coffee was probably too weak and cold that morning. I take full responsibility for my mistake. The purpose of this post is to help others who may be thinking about creating a website called “www.DealsFromTarget.com” or “www.ILoveCrosstfit.com”. The email stated that they were concerned with my registration and use of facebookgroupslist.com. And that I voilated the Lanham Act (15 U.S.C. 1051 et seq.) because it infringes and dilutes the famous Facebook trademark. For a split second I wondered if I should take on the lawsuit by Facebook to prevent me from redoing 3 hours of work and losing $14.95. Just kidding! I removed the site. This finally prompted me to purchase a theme for my website. And I went with Divi from Elegant Themes. It’s super fantastic and I love the powerful Divi builder that allows me full control of my site’s layout and content. And bonus, it creates beautiful landing pages. I contacted SiteGround, my hosting provider, and asked them to remove the url I purchased. They gladly helped me and even refunded my $14.95! I also shared my story on Facebook groups. Immediately other bloggers shared similar stories. I was so thankful I was not the first one making this mistake. So What are the Rules Against Trademark and Copyright Infringement? Copyright applies to things such as books, music or images. It is the artists’ right to make copies of his or her products. And it protects them so others may not profit from their hard work. Trademark on the other hand is an image or slogan associated with a company. Like in my case, the word “Facebook” is trademarked to the Facebook company. When I created a domain name with their trademark in it, it diluted their brand and could confuse others. I completely understand why Facebook emailed me and I appreciate them giving me the chance to correct the issue. Read here about the differences between a trademark or copyright infringement. And here are examples of the difference between trademark and copyrights. Most bloggers will share this article with their friends to prevent them from making the same mistake. Remember, when you help others, they want to help you! Holy macarole! Facebook coming after individuals…now that is scary stuff. But A+ idea on your part – that’s a fabulous opt-in incentive! I also want to let you know that when I attempted to subscribe to the list, I’m getting an error. Thank you Lisa! I’ll check it out!! I had not thought about this and your post made me aware of the negatives that could potentially happen. Something similar happened to a college club, whose mascot looked a little too much like one of the NFL teams. They got a letter from the team’s lawyer telling them to redesign their logo so it looked less like the NFL team’s logo. Ah, good story! Thank you for sharing Sarah!! I tried to download the list but it says there’s an error. Can you help me? Thank you for sharing this with us! I have been reading so much about creating blogs that I never thought about the downside to creating the “wrong” name. At least we can all learn from this! Thank you so much Karis! Great post and you are always so helpful. I’m also trying to get the 40+ but there’s an error. Omg this is too funny. I would have pooped my pants. Love this story thank you for sharing.